I still remember the first time I made tiramisu and how scared I was that all of us were going to be sick from eating raw eggs. The good news is that no one got sick that day and the better news is that everybody loved it because it came out amazing. 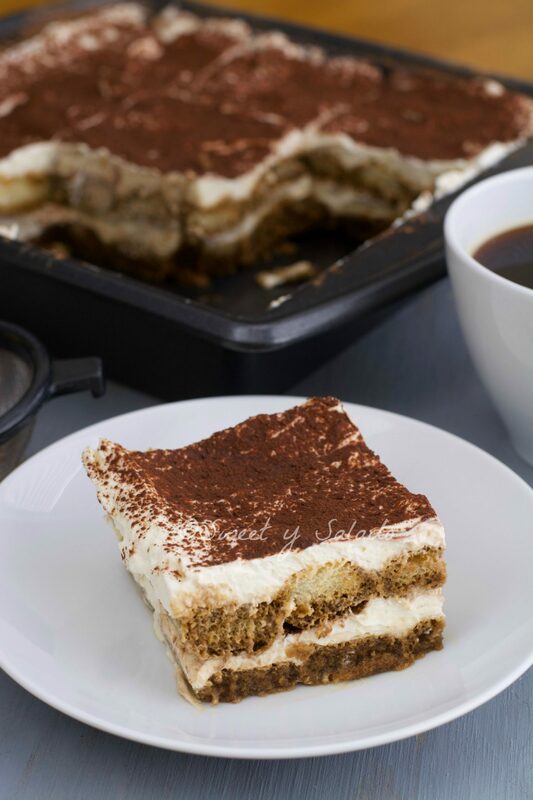 And the thing is, the ingredients you use to make tiramisu guarantee for it to be a fantastic sweet treat. Since that day I have also learned how to make it without using raw eggs and it’s the way I prefer to make it nowadays. It comes out just as delicious, you don’t miss the egg flavor at all and everybody loves it. In my opinion, one version is not better than the other but I do prefer to make it the way I show you in this recipe. Another change I make is to leave out the coffee flavored liqueur and it’s simply because several people in my family don’t like it, but if you want you can add it to taste, 3-4 tablespoons should be good enough. And if you can’t find mascarpone cheese you can substitute it with regular cream cheese. 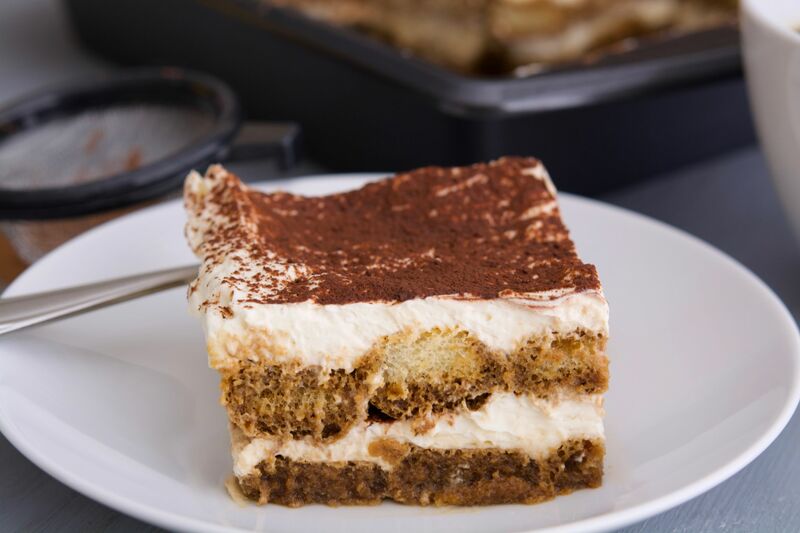 Both have a very similar flavor but the mascarpone has a higher fat content which gives the cream in the tiramisu that delicious flavor. If don't have strong coffee already made you can make it by mixing the instant coffee with the hot water. Let it cool completely and then you can add the coffee flavored liqueur if you're using it. Set aside. Whip the whipping cream in a medium bowl until it's firm and thick. Don't over whip so it doesn't curdle. (You can put the bowl and whisk in the freezer for about 15 minutes before so that it whips easier). Set aside. In a separate bowl mix the mascarpone cheese, sugar and vanilla extract. Now gently add the whipped cream so you don't lose its volume. Soak each ladyfinger in the coffee and then place them at the bottom of the pan or dish you're using (I usually use an 8 x 8 inch (20 x 20 cm) dish) to make one layer. 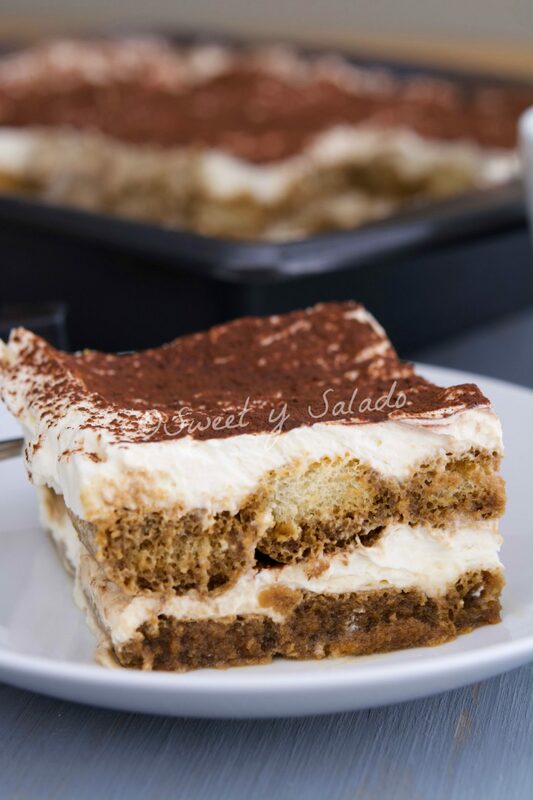 Place half of the amount of the mascarpone cream on top of the ladyfingers and sprinkle with cocoa powder to taste. Repeat this process to make a second layer. Cover the tiramisu with plastic wrap and refrigerate at least 4 hours before serving. 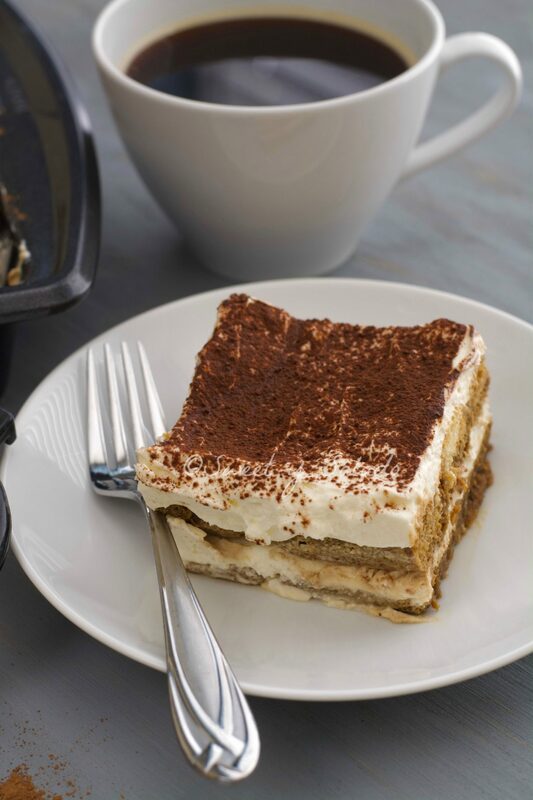 It's best to refrigerate the tiramisu overnight so the flavors can intensify. You can also freeze it 20-30 minutes before serving so that it's easier to cut into portions.